In its advisory opinion on the wall of July 2004, the International Court of Justice (ICJ) reaffirmed the illegality of the construction of the wall and Jewish settlements in the occupied Palestinian territories, including East Jerusalem. According to the ICJ construction activities should stop immediately and the wall and settlements should be dismantled. Palestinians who lost property because of the illegal construction activities should be compensated for their loss. The use of Volvo construction equipment in illegal activities is a breach not only of international law, but also of Volvo’s own Code of Conduct. Volvo Group is informed about the illegal practices of Israel in the occupied territories, and knows the Israeli military use Volvo equipment in a destructive way. It is not sufficient to sit back and refer to a Code of Conduct. Volvo should be concerned and rather investigate how construction equipment can end up this way in the hands of the Israeli military. The company should enforce the Code of Conduct in its dealings at all levels. Volvo Group’s Code of Conduct becomes a meaningless piece of paper, when the company is not acting upon it. Meanwhile, the list of documented use of Volvo equipment in illegal activities of the Israeli forces is growing. 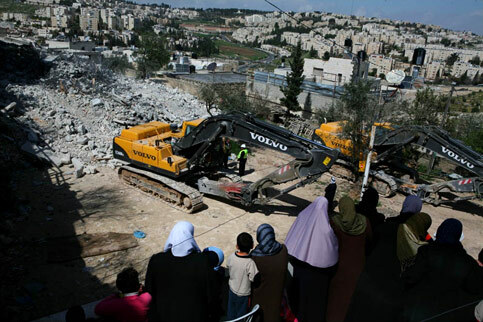 In March 2007, Volvo equipment was used in several home demolions , including in the demolition of Abu Snena’s house in Wadi-Qadum neighborhood in East Jerusalem. On 25 June 2007, the unrecognized Bedouin Palestinian villages Atir and Um Hayran in the Naqab (Negev) were attacked by more than 1,500 Israeli soldiers. Hussein al Rafay’a, head of the Regional Council for the Unrecognized Villages (RUCV) in the Naqab, was arrested because he tried to block the Israeli forces and machinery from approaching the villages and its inhabitants. 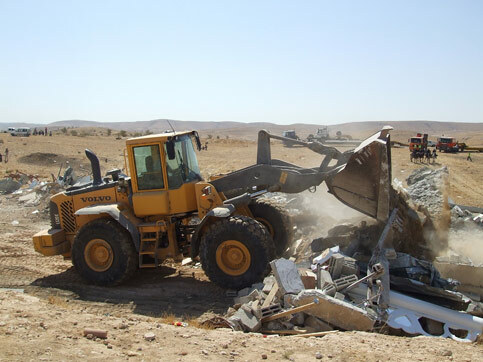 His colleague managed to take pictures of the demolitions, showing how the big, powerful, yellow Volvo bulldozers razed the homes of the Bedouin villagers to the ground (see picture below) .At least twenty houses were demolished and properties were confiscated, leaving over 150 men, women and children homeless. In April 2010 Volvo equipment is seen being used by the Israeli forces to prepare the construction site for the wall around al-Walaja. The residents protested the confiscation and demolition of their property. The Israeli settlements of Har Gilo and Gilo, established in the 1970s, are built on land confiscated from the village. While Israeli forces try to silence the protesters with harsh measures, Volvo and Caterpillar equipment is used by the Israeli forces in the illegal construction of the wall on the village’s land. 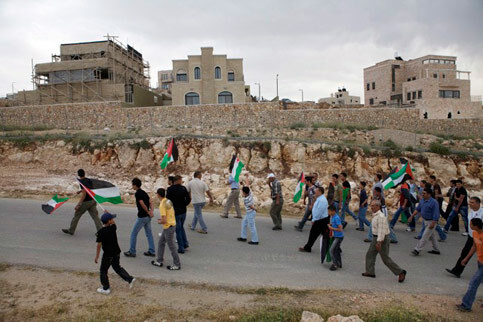 On 16 April, approximately 100 Palestinian villagers and internationals walked towards the construction site of Israel's wall in the occupied West Bank village of al-Walaja, four kilometers northwest of Bethlehem. When the protesters were leaving the village, four Israeli army jeeps and one police vehicle entered and surrounded a Palestinian home. At least 40 persons, including women and children, were trapped for two hours. Meanwhile, Israeli forces raided several other homes, detaining three young men for allegedly throwing stones at Israeli forces. During the raids al-Walaja was closed off, and soldiers prevented the media from entering the area. Six days later, Israeli bulldozers were working full speed deeper inside the village's lands, leaving destruction in their wake. Ma'an news agency reported that border guards and soldiers had imposed a curfew early in the morning. A cameraman was denied entry to the village by the army, according to representatives of the village's Popular Committee. 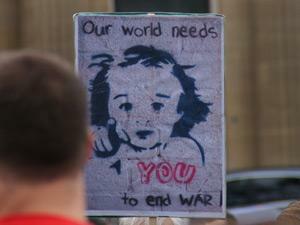 The following day approximately 200 villagers, together with a few internationals, came together for yet another demonstration. They walked from the mosque, which has an Israeli-imposed demolition order against it, to the lands which were bulldozed the previous day. Standing on the bulldozed lands, representatives of the village held speeches calling for more demonstrations. 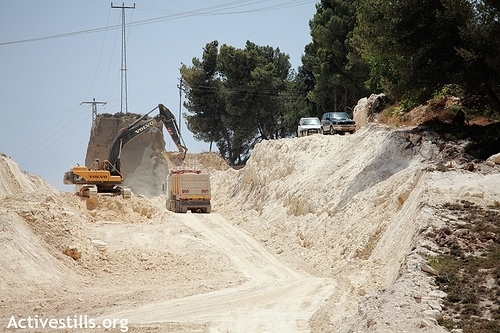 Youths used boulders to block the road used by the Israeli bulldozer operators. A day later, approximately 50 Palestinians and internationals managed to stop the work of the bulldozers for several hours. The Israeli soldiers had to violently drag the villagers away one by one. 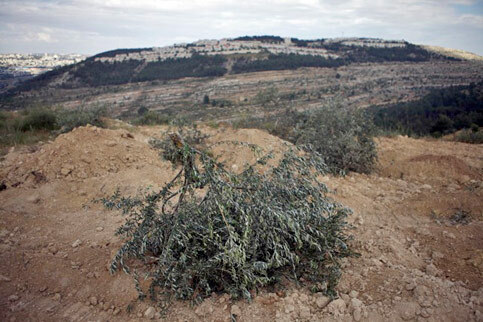 An uprooted olive tree in al-Walaja with the Har Gilo settlement seen in the background. The residents of al-Walaja have protested the confiscation and demolition of their property for many years. 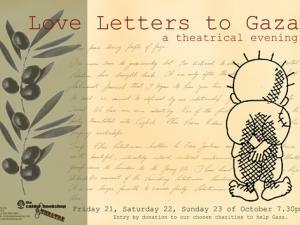 The Israeli settlements of Har Gilo and Gilo, established in the 1970s, are built on land confiscated from the village. While Israeli forces try to silence the protesters with harsh measures, Volvo and Caterpillar equipment is used by the Israeli forces in the illegal construction of the wall on the village's land. The old village of al-Walaja was occupied and destroyed by Zionist forces in October 1948 and its 1,200 Palestinian residents expelled. The 1948 Armistice line passed through the southern lands of the village and while most of the villagers fled to Jordan and Bethlehem, some villagers stayed on the lands of the village that were unoccupied at the time and eventually rebuilt a new town. The remains of the old village of al-Walaja are two kilometers outside the new town, on the western side of the armistice line between Israel and the West Bank. According to Palestinian historian Walid Khalidi, a few stone houses still stand on the old village site. Today the old village of al-Walaja is used by Israeli settlers for picnicking and bathing. Following the June 1967 war, Israel annexed the rest of al-Walaja's lands, bringing them under the authority of the Israeli-controlled Jerusalem municipality. The villagers did not receive the right to live in Jerusalem, however, and they live under constant threat of expulsion. And while the villagers of al-Walaja are not allowed to build on their own lands, the settlement of Har Gilo is expanding. After the Oslo accords of 1993, al-Walaja was designated "Area C," giving Israel full military and administrative control. As a consequence, villagers who want to build a house on their own land have to ask permission from Israel. Israel denied 94 percent of the building permit requests of Palestinians in Area C of the West Bank from 2000 to 2007, according to Peace Now. 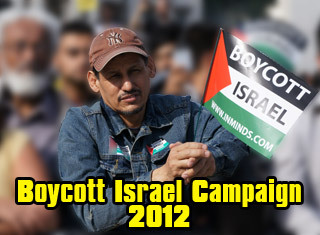 Villagers are facing increased pressure from the Israeli occupation forces to leave their land. The wall which is currently under construction will surround the village from all sides, isolating the villagers completely from their land, East Jerusalem and the old village. 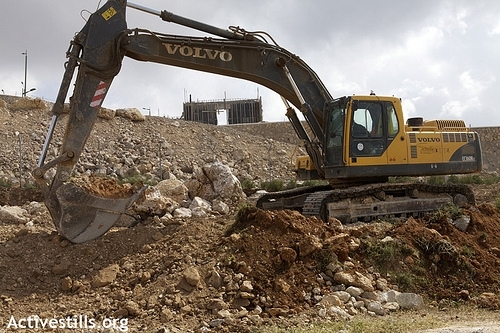 Israel uses Volvo equipment to destroy homes and farmland in al-Walaja. At the end of the 1980s Israel started to demolish Palestinian homes in al-Walaja and residents had to pay fines for their "illegally"-built homes. Since the outbreak of the second Palestinian intifada, Israeli forces demolished more than 24 houses in the village, according to the Applied Research Institute of Jerusalem. On 18 March two house owners in al-Walaja found military orders in Hebrew on the front doors of their homes. The orders concern the demolition of the two houses because they are located too close to the path along which the wall will be built. The following day, volunteers from the Stop the Wall Campaign, the YMCA and other international volunteers gathered with the owners of the houses under demolition in order to show their solidarity. ActiveStills photographer Anne Paq witnessed Volvo equipment being used to destroy a home in the nearby village of al-Khader. Two days earlier she had taken pictures of Volvo and Caterpillar equipment working between the road and the fence of Har Gilo settlement, just a few meters away from Palestinian houses in al-Walaja. There was an Israeli police car parked next to the works. When Paq asked what they were building, they refused to answer. Two years ago The Electronic Intifada first reported the use of Volvo equipment in Israel's violations of international law in the occupied West Bank. So far the company has taken no action to investigate the use of its equipment in Israeli violations of Palestinian rights. Volvo Group's vice president of media relations and corporate news, Marten Wikforss, wrote in response to The Electronic Intifada's report: "we do not have any control over the use of our products, other than to affirm in our business activities a Code of Conduct that decries unethical behavior." While the villagers of al-Walaja steadfastly continue their protest against the construction of the wall, the confiscation of their land and the destruction of their property, Israeli forces are increasing the oppression. Some houses have been rebuilt three or four times. Director of the Joint Advocacy Initiative of the East Jerusalem YMCA and YWCA, Nidal Abu Zuluf, explained: "Israel's current repressive policies aim to prevent acts of popular resistance. They don't want the media and internationals to be around." Perhaps neither does Volvo, as its equipment continues to be photographed destroying Palestinian homes and violating Palestinian rights. All images by Anne Paq / ActiveStills (wwww.activestills.org). 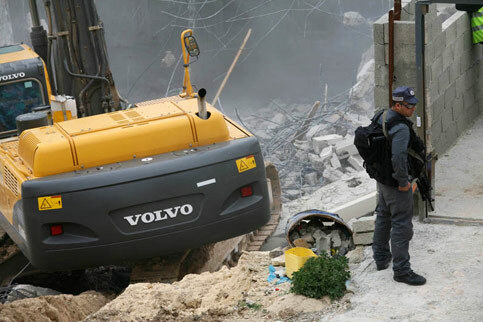 Following reports published by The Electronic Intifada on the use of Volvo equipment in the demolition of Palestinian houses in 2007, the Volvo Group stated that it did not condone the use of its equipment for such purposes. Claiming to have no control over the use of its products, Volvo affirmed that its Code of Conduct decries unethical behavior. In spite of these claims, The Electronic Intifada has found that through its Volvo Buses branch, the Volvo Group is providing armored buses to transport Israeli settlers in the Occupied Palestinian Territories (OPT). 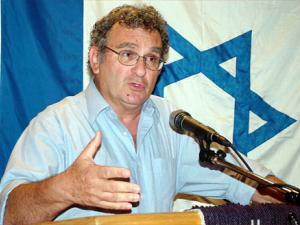 Volvo Buses is co-owner of Merkavim Ltd., an Israeli transport technology company. Another shareholder in the company is Mayer's Cars and Trucks, the exclusive Israeli representative of companies from the Volvo Group. According to Merkavim's website, the company was chosen by Volvo as "its major body builder in the Middle East." 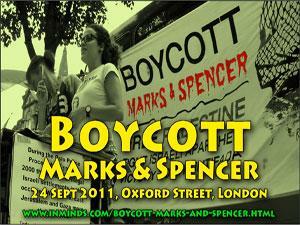 However, the Who Profits from the Occupation? project recently reported that Merkavim manufactures an armored version of Volvo's Mars Defender bus for the Israeli public transport company Egged. Egged uses the Mars Defender to provide bus services for illegal settlements in the occupied West Bank. According to Merkavim, in the video promoting the bus, the Mars Defender "looks like any other modern bus," but it is "the world's most armored bus." Indeed, the company calls it "the bus that saves lives!" As the narrator explains that the bus is "designed to safeguard the most precious cargo," the camera pans over Israeli soldiers lining up to board the bus and on patrol with their machine guns at the ready. The video explains that Israel has "adapted its world renowned expertise in military and defense technologies to deal with" the "growing threat" of "terrorists and hostile forces." It adds that Merkavim "blends this state of the art know-how with its own expertise" to produce the Mars Defender. Built on a Volvo chassis, the Mars Defender's sides, front, roof and floor are shielded with steel armored panels and it is fitted with bullet- and explosion-proof armored glass windows as well as "run-flat" tires. According to the company, these safety measures allow the bus to withstand "grenades, car bombs, roadside charges and 7.62 caliber armor-piercing bullets." Merkavim claims that these features are needed because "people trust this bus with their lives." The 2004 advisory opinion of the International Court of Justice on Israel's wall in the West Bank confirmed that settlements violate Article 49 of the Fourth Geneva Convention. Article 49 explicitly states that the Occupying Power is not allowed to deport or transfer parts of its own civilian population into the territory it occupies. Bus services with Volvo subsidiary's Mars Defender armored buses facilitate the maintaining of illegal settlements in the OPT. In its Code of Conduct, the Volvo Group commits itself to support and respect the protection of human rights and to ensure that it is not complicit in human rights abuses. However, by providing construction and transportation equipment that facilitates Israel's occupation, the company violates this Code of Conduct on a daily basis. With increasing calls for boycott of and divestment from companies that support Israel's occupation, Volvo Group can expect activists around the world to put pressure on responsible investors to divest from the company and to call on public bus companies not to buy Volvo buses. The photographers of the group Activestills have documented Volvo equipment being used for the illegal construction of the wall and the settlements, and the demolition of Palestinian houses in Israel and occupied Palestine. Activestills gave special permission to publish some of the images on The Electronic Intifada to inform a wider audience about the systematic use of Volvo equipment in house demolitions in East Jerusalem. The Israeli government zoned almost all the undeveloped Palestinian land in East Jerusalem as "open green space" after 1967. The Israeli leaders decided to increase the Jewish population in East Jerusalem rapidly, to hinder growth of the Palestinian population and to force Palestinian residents to make their homes elsewhere. Withholding permission from Palestinians to build houses in East Jerusalem and the demolition of Palestinian houses fit in this policy. 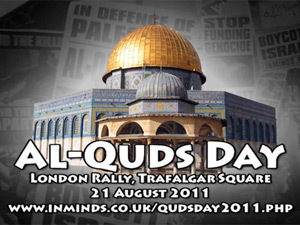 Houses built before 1967 and houses built without a permit more than seven years ago are considered "legal" by Israel. 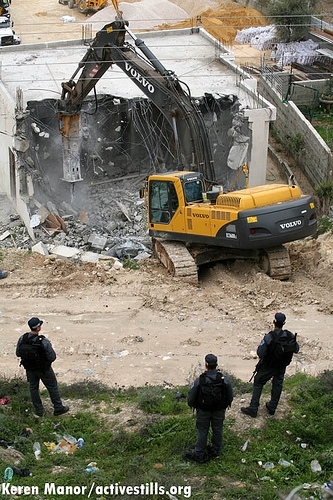 For all the other Palestinian houses in East Jerusalem Israel thinks it can justify demolition. West Jerusalem city engineer Shitreet gave a bizarre example of reasoning, "We can bar residents from entering their homes, even if we can't destroy them." And by sealing the homes and preventing the Palestinian residents from entering their homes, they can be demolished after some time as "abandoned" or "absentee" property. Volvo's bulldozer leaving the neigborhood of Silwan in East Jerusalem after a home demolition, January 2007. Without any prior warning the house of Mahmoud Ahmad al-Abbasi in al-Sweih neighborhood in Silwan was demolished by Jerusalem municipality bulldozers on 16 January 2007 under the pretext of being unlicensed. The house gave shelter to six people. According to the Land Research Center, al-Abbasi said after the demolition, "The soldiers behaved terribly with the residents of the neighborhood. I wasn't in the place at the time of the demolition. I knew about the soldiers heading there, so I rushed back and asked the police officer and the representative of the municipality to show me the demolition order. They said 'we'll show you,' after which they handcuffed and transported me to the nearby police station until the demolition was completed. They even demolished the lower section of the house which was not included in the demolition order. The soldiers even beat a number of my relatives and people from the neighborhood and detained a number of them at the police station until the demolition was done." House demolition in the Sur Baher neighborhood of East Jerusalem, January 2007. Six days later the four-story building with eight housing units owned by the sons of Mohammed Hammad A'mas in Sur Baher was demolished by bulldozers of the Jerusalem municipality accompanied by Israeli security personnel. One son rushed to the house when he heard about the demolition. He was beaten by the police and detained in a police jeep along with his brother-in-law to prevent him from reaching his house. Later they were transferred to al-Mukabber police station where they were kept until the demolition was over. The building was demolished under the premise that it was built without a proper permit. House demolition in the Sur Baher neighborhood of East Jerusalem, March 2007. Forty-one Palestinians were made homeless on 14 March 2007 when the house owned by Ali Isma'il Abu Sarhan and four housing units owned by Musa Shehada 'Attun was demolished in Sur-Baher. Ali Abu Sarhan lived with his ten-member family in the house since 2002. Palestine News Network reported, "Abu Sarhan was surprised to find a large presence of police and border guards, along with the municipal crews who began removing furniture from the house while the bulldozers got started on the other side. A building not yet inhabited was also destroyed. The house was constructed, but the owner was awaiting a building permit from the Jerusalem municipality to move in since 2003. He said, 'When I saw the police and bulldozers I went to the Jerusalem municipality to again postpone, but they would not. I spent half a million shekels building this home.'" House demolition in the Wadi-Qadum neighborhood of East Jerusalem, March 2007. On 20 March 2007 an Activestills photographer registered the demolition of Abu Snena's family house in Vadi Qadum, East Jerusalem. The Land Research Center registered that 97 housing units in East Jerusalem were demolished in 2007, leaving 218 adults and 311 children under the age of 18 homeless. 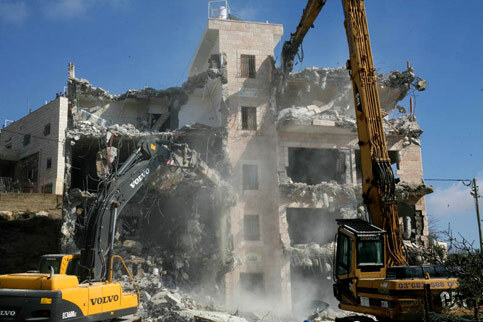 In 2006 the center documented the demolition of 78 housing units in East Jerusalem. 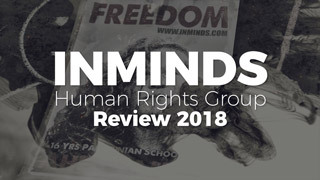 The Business & Human Rights Resource Centre in London published on its website a link to my article "Volvo: Symbol of safety or human rights abuses?," and asked the company to respond. 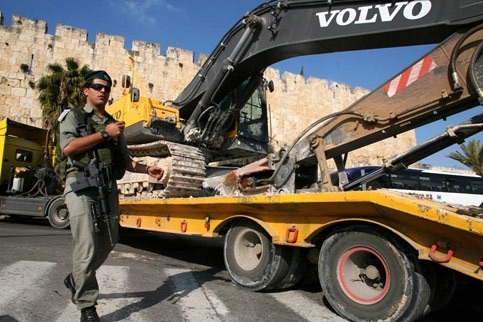 The article highlights the use of Volvo construction machinery by the Israeli military as a tool in the occupation, which is the reason behind recent calls for economic pressure on Volvo. Mr. M. Wikforss, Vice President of Media Relations & Corporate News of Volvo Group wrote a letter in response, which is also published on the Resource Centre's website. In this article I react to Volvo's arguments. In an email accompanying the letter to the Resource Centre, Wikforss clarifies that Volvo Cars and Volvo Group are not part of the same company. Volvo Cars used to be part of the Volvo Group, but was sold in 1999 to the Ford Motor Company. Volvo Group consists of nine different business areas, including Volvo Trucks and Volvo Construction Equipment. Volvo Construction Equipment is the manufacturer of the piece of equipment seen in the photo that was published in the article, according to Wikforss. Although Volvo Group and Volvo Cars are not part of the same company, there are still close ties. When Volvo Group sold its car division to Ford Motor Company, both companies established a new company, Volvo Trademark Holding AB, to manage the Volvo brand. It is owned by Volvo Car Corporation and Volvo Group. The president and CEO of Volvo Group, and the chairman and CEO of Ford Motor Company manage the Volvo Trademark Company. It holds its offices in Volvo Group's headquarters in Stockholm. The links between the companies may become even closer, if the Forbes and Reuters reports on Volvo Groups interest to buy a minority stake in Volvo Cars turn out to be right. The news was first published in the Swedish business daily Dagens Industri. The reaction of Leif Johansson, CEO of Volvo Group, to the reports was: "No comment, that's not a debate I want to get into." The vision that Volvo wants their cars to be the safest and most exciting car experience is obviously from Volvo Cars. However, safety is also important for Volvo Group, and is one of its corporate values. According to the website the wheeled excavator, which has been used by Israeli forces to demolish Palestinian homes in the West Bank, is, "A complete machine that's perfect for any job -- both on and off the road." And about the Volvo wheel loader that is also used by Israel to violate Palestinians' human rights, Volvo Group writes, "It's our job to help you do yours -- no matter how big." Code of Conduct or lip service? In his letter Wikforss writes that Volvo Group does not condone the destructive use of Volvo equipment and would regret the use of its products for destructive purposes. However, "we do not have any control over the use of our products, other than to affirm in our business activities a Code of Conduct that decries unethical behavior," according to Wikforss. The Volvo Group Code of Conduct contains the following sentence on human rights: "within its sphere of influence, the Volvo Group supports and respects the protection of internationally proclaimed human rights and ensures that it is not complicit in human rights abuses." In its advisory opinion on the wall the International Court of Justice (ICJ) reaffirmed the illegality of the construction of the wall and Jewish settlements in the occupied Palestinian territories, including East Jerusalem. According to the ICJ construction activities should stop immediately and the wall and settlements should be dismantled. Palestinians who lost property because of the illegal construction activities should be compensated for their loss. The use of Volvo construction equipment in illegal activities is a breach not only of international law, but also of Volvo's own Code of Conduct. Volvo Group is informed about the illegal practices of Israel in the occupied territories, and knows the Israeli military use Volvo equipment in a destructive way. It is not sufficient to sit back and refer to a Code of Conduct. Volvo should be concerned and rather investigate how construction equipment can end up this way in the hands of the Israeli military. The company should enforce the Code of Conduct in its dealings at all levels. Volvo Group's Code of Conduct becomes a meaningless piece of paper, when the company is not acting upon it. In a submission to the Special Truth and Reconciliation Commission Hearing on the role of business, the African National Congress praised Volvo. "South African and international companies were involved in breaking the oil embargo and the laws of a number of countries. National and multinational companies continued to supply fuel to the SADF notwithstanding protests from their shareholders (international) and representations from the ANC. They justified their actions by claiming they were forced to do so by the laws of South Africa ... Among the notable exceptions are the Volvo Group in Sweden and Wates Construction in the UK. ..." The late President of the ANC, Oliver Tambo, said in May 1987, "It is difficult for us to accept the argument of business both inside and outside the country that it is politically impotent. Business has chosen, until now, to align itself with and benefit from the economic and military state that is part of the apartheid system." It is clear from the past that Volvo has the capacity to make the right choice. 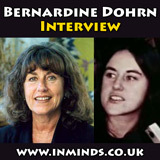 Adri Nieuwhof is an independent consultant and human rights advocate based in the Netherlands. On their website Volvo says they want their cars to be "an exciting experience." 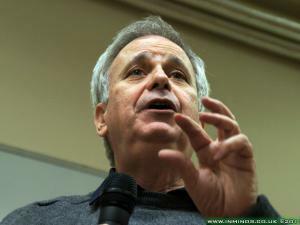 At its annual conference, 8 to 10 June this year, the New England United Methodist Church issued a report on companies which were identified as supporting the Israeli occupation of Palestine. The report is a product of a Divestment Task Force, consisting of eight clergy and lay members, which was created to implement the resolution on divestment as a peaceful way to work towards justice and peace in the Middle East, adopted at the annual conference of 2005. The task force has done extensive research, and examined many companies to determine whether they support significantly the Israeli occupation. Each identified company was contacted in writing with the concerns, and given a defined period to respond. The report is transparent about the data that were collected. The report also includes a list of twenty companies, including Volvo, from which United Methodist individuals, churches and investment managers in the New England Conference are encouraged to divest. On the basis of well the documented research the United Methodist Church came to the conclusion that Volvo supports the Israeli occupation of Palestine in a significant way. The report states, "Volvo bulldozers have been photographed and videotaped destroying Palestinian homes. They have also been used in Israel's construction of the Separation Wall, which is on Palestinian land and has been declared illegal by the International Court of Justice. Mayers Cars and Trucks in Israel is a Volvo distributor, and according to Israeli sources is one of the main providers of construction equipment for the settlements and the wall." The United Methodist Church's blacklisting of Volvo followed calls from War on Want and Pax Christi for economic measures against Volvo as a company profiting from the Israeli occupation. Symbol of safety or abuse? Many drivers choose a Volvo car because of the perception that it provides safety for the family. For the Bedouin Arab families in the unrecognized villages in the Naqab the Volvo brand has a completely different meaning. When the yellow Volvo bulldozers enter the villages, the owners of the houses that have received a demolition order from the Israeli authorities, feel anger, hatred and fear. They know that the Israeli forces bring in the Volvo bulldozers to destroy their homes, leaving them, their children and grandchildren behind in insecurity. Adri Nieuwhof is human rights advocate based in the Netherlands.